Is it possible for a work of fiction to change the way you feel about death? The cynic in me wants to *insert bible joke here* but I really I must refrain because The Book Thief, by Markus Zusak, has affected me so profoundly that it would be crass to detract from that. It’s a book that you devour, but want to take in slowly at the same time. You want to savour the writing; which is truly astonishing. A work that is utterly beautiful, compelling, heartbreaking and darkly humorous all at once. One of the most unusual (and engaging) elements of the tale is that it is narrated by Death. A character who you’d expect to feel no sympathy for, the antagonist, the guy you want to fail. However, within the first few lines of the Prologue – you cannot help but feel warmth and empathy, and a sense of cautious appeal, as the narrator introduces himself. Beginning in 1939 Nazi Germany, we meet Liesel Meminger, a 9 year old foster girl moving in with her adoptive German parents in Munich. Her biological parents have been taken to a concentration camp, her small brother has been taken by the narrator. She lives a poor and meagre existence, taking pleasure in such small things – a stolen book, the opportunity to learn to read, and the music from her Papa’s accordion. Throughout the course of the tale, the narrator observes Liesel; her penchant for thievery, her friendship with a neighbourhood boy, and her family’s struggle to remain safe but morally responsible in a time filled with Nazi propaganda, falling bombs and human atrocities. It’s kind of daunting to have a story narrated by death, it sounds chilling and a bit creepy. But in actual fact, the character brings such light and love to a dark and sad tale, that I have myself wishing that his existence were real. He treats the souls he collects with such compassion and care that I can’t help but think of loved ones I’ve lost, and hope (however futile) that they too were met with the same gentleness at the end. This is not a book to read while sipping cocktails at a beach resort, or on a long haul flight where sobbing would be discouraged. It would be challenging to take in if you have personal grief that is fresh. But if you lie in bed, free of distraction, on a cold winter’s night and read Death’s tale of the book thief, you’ll be fulfilled and moved, and changed forever. 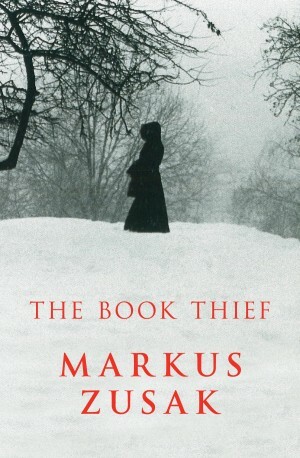 This entry was posted in Literary Fiction and tagged Markus Zusak on April 19, 2013 by jadetam. Loved it. Who would have thought you could actually connect so warmly with a death persona. Also liked the write-it-as-you-think-it style.